Today’s generation of young children are far more focused and intuitive than I was when I was a kid. They’ve got goals and big aspirations and they’re acting on them. Some of them are accomplishing some amazing feats so early on in their lives. Cooking is one of those big ventures. There are several cooking shows on television where young kids compete for the title of junior chef. More and more kids are basically starting their careers in junior high or earlier. Young Gordon Ramsay’s and Rachel Ray’s are popping up everywhere and parents and mentors are encouraging them to go big. For those newbies who have hopes of being the next young culinary superstar, new cookbooks are available for them to hone their skills. 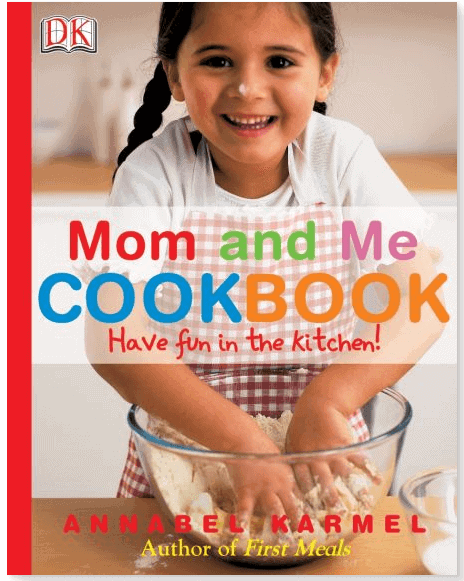 The Mom and Me Cookbook is a perfect beginner recipe book for kids. It’s filled with big, bold and colorful images of real kids and their moms making the recipes. All the recipes are simple to make and easy to follow with step-by-step visual instructions. The introduction page shares tips and the eleven different cooking skills they will learn from mixing to kneading. It also shows images and the name of the utensils and equipment they’ll need to make the included recipes. These same images will show up in the legend at the top of each recipe so kids will know at a glance what items they’ll need. Other symbols included in the legend are the number of people it will serve and when an adult is needed to help make the recipe. Some of the recipes to make are Potato Mice, Avocado Frog Dip and Raspberry Ripple Cheesecake. Kids will have fun in the kitchen and feel a big sense of accomplishment when they are able to make tasty and nutritious meals for their family. 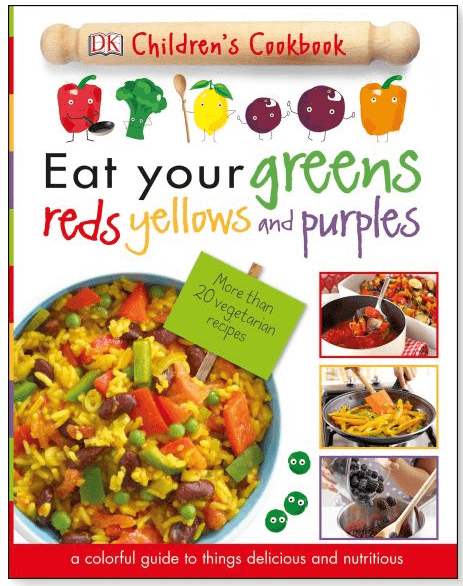 Eat your greens, reds, yellows and purples will introduce kids to a rainbow of vegetables and the value of vegetarian cooking. Kids naturally gravitate to vivid colors and this cookbook is filled with bright images of vegetables and kids cooking them. This cookbook is divided into five colored sections that reflect the color of vegetables, so the reds will only focus on recipes that use red vegetables, and so on. Each section has an introduction page where kids will meet fruits and veggies of that specific color. The introduction page shows all the utensils and equipment they’ll need. There is a key that explains other symbols like prep time, cooking time, serves and when an adult is needed for safety reason. Preparing Your Ingredients page will teach kids how to carefully peel, cut and spoon various vegetables. All these instructions are images of kids doing each step. Kids will learn to appreciate the nutritional in the different vegetables we have access to and to incorporate them into tasty dishes. Some of the recipes kids will make are Zucchini frittata (green), Red pepper hummus (red), Fruity raisin granola (purple), Cornbread mountain (yellow) and Sweet potato omelet (orange). This children’s cookbook is beautifully laid out and a lot of fun for kids to learn more than 20 vegetarian recipes. love to win so when my grandkids are over we can make some of the recipes! They love to help in the kitchen! My granddaughter is 10 years old and she is interested in learning to cook. This would be fun for her to try new easy recipes. I would love to win this prize because I enjoy teaching and cooking with my great niece and great nephew. For our grandkids…who love cooking. I would love to cooke with my niece and nephew. I want to win this togive to my friend’s child. I want to win this prize for my little man to learn how to cook! I would love to win this for my granddaughter, it’s awesome to teach them when they are young! My young grand daughter is taking cooking classes and she would love these books!! I would love this because my seven year old loves to cook, and she loves reading cookbooks. I’d love to win because my daughter loves to cook (especially with daddy). I think it’s super important for kids to learn this skill so they have healthier lives as they grow up (and not depend on instant food or pre-cooked, processed stuff). My daughters love to help cook and I feel it is important for them to learn to cook so that they have that ability when they are adults. This would be great to share with my daughter. Thanks! My daughters would love to use this in the kitchen! I would like to win this for my two boys to enjoy using. I’m having a hard time with my picky 5 year old. I’m hoping this would make healthy food more fun for him. Nice for my grandchildren. Great for them to cook for themselves. I want to win this prize so I can give it to my grandson. I want to win this because my young kids love to try to help cook but I have a hard time deciding what they actually can help with, this would be great. I would like to win cookbook for my little man. He loves cooking and baking with me! Because I’m a vegetarian and I love to cook with my kids!! My son and I are always looking for new things to do together. Some awesome recipes would be right up our alley! My niece loves to spend time in the kitchen help her mom. These would make the experience more fun. I want to win this prize because my granddaughters love to bake. my granddaughter loves to cook so I think she would really enjoy this! My granddaughter loves to give a hand in the kitchen with cooking and cleanup. This would be perfect to enjoy some new recipes with her! Would love to win and cook with my niece — and my daughter, when she is old enough!! I’d love to cook family meals with my niece and cousins! I would love to win this terrific book, so I can cook the meals with my grandson, he enjoys cooking & baking with his Mom & Dad. 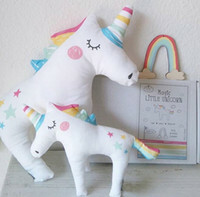 It would be a great gift for my niece! I would love to win this Children’s Cookbook prize pack for my two grandchildren as it will help them appreciate eating vegetables by learning the nutritional value in the different vegetables. Also to teach them hands-on preparation of tasty dishes that provide valuable nutrients that our bodies need will build their self confidence and understanding of the importance of eating healthy. Learning the how-to’s of cooking at a young age is an invaluable skill. Therefore I would be delighted to win this giveaway for my two grandchildren as I think they would love the experience of learning to cook! Thank you for this opportunity to win. Happy holidays to all! My son loves watching cooking shows and I’d love to have some more inspiration for him in our kitchen. A perfect gift for either my own kids or my godchildren. Thanks. I’d love to get this for my children who love to cook. I’d love to win this to cook with my daughter! I would love to win because my daughter starts to develop an interest in cooking and this will be of great help to her! It’s a great way to give kids some ownership in the kitchen! I’d like to win this for my oldest daughter as she’s taken an interest in cooking! I would love to win so I can give this to my niece. She would love this! I would love to win as I think cooking is such an important skill to have! Cooking is an important life skill – this looks like a great way to inspire kids! I need all the help/inspiration I can get to have Miss R learn to cook so this set is perfect. I love trying new recipes with my kids. I have 2 granddaughters who I would like to interest in cooking. I want these because my 2 kods love cooking in the kitchen with me. A children’s cookbook would be helpful in getting my daughter more involved in the kitchen, making recipes that are appropriate for children. And hopefully will give her the courage to try and enjoy new foods. my daughter loves to cook – would be great to have this opportunity to help foster an appreciation for food and its preparation! I’d like to win to see if it would help my 6 year old find some vegetarian recipes she can enjoy if she can help with preparing them. These would be great for my kids. They love to cook.